Coverage: Hills Estates deal principally with the Management of Residential Houses and Flats and Commercial properties for select Clients throughout the Rotherham area. 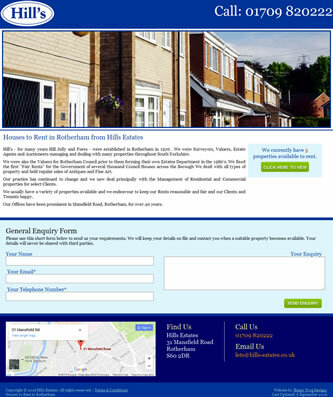 Specification: Hills Estates had an existing website which had not been updated for some years and no longer reflected the aims of the business. Sleepy Frog Designs created a mobile-friendly, content managed system which allowed the client to update their website easily when required.